PHOENIX, Nov. 2, 2017 /PRNewswire/ -- Republic Services, Inc. (NYSE: RSG) today reported net income of $223.2 million, or $0.66 per diluted share, for the three months ended Sept. 30, 2017, versus $85.6 million, or $0.25 per diluted share, for the comparable 2016 period. Excluding certain gains and expenses, on an adjusted basis, net income for the three months ended Sept. 30, 2017, was $225.2 million, or $0.67 per diluted share, versus $212.6 million, or $0.62 per diluted share, for the comparable 2016 period. "We are pleased with our third-quarter performance, which included high-single digit growth in earnings and free cash flow per share. Thus far in 2017, we have invested approximately $385 million in acquisitions, including the purchase of ReCommunity. Our pipeline for the remainder of the year and into 2018 is robust and will serve as a catalyst for future growth," said Donald W. Slager, president and chief executive officer. "Our continued ability to profitably grow the business both organically and through acquisitions illustrates the effectiveness of our strategy and our commitment to creating long-term shareholder value." EPS was $0.66 per share. Adjusted EPS, a non-GAAP measure, was $0.67 per share, an increase of 8 percent over the prior year despite a 1-cent headwind due to the hurricanes. Year-to-date cash provided by operating activities was $1.4 billion and adjusted free cash flow, a non-GAAP measure, was $606 million, an increase of approximately 5 percent over the prior year. Total cash returned to shareholders through dividends and share repurchases was $227 million. Year-to-date cash returned to shareholders was $682 million. Total revenue increased 6.3 percent over the prior year. Revenue growth from average yield was 2.5 percent and volumes increased 1.6 percent. Core price increased revenues by 4.1 percent, which consisted of 5.1 percent in the open market and 2.3 percent in the restricted portion of the business. Adjusted EBITDA was $718 million and adjusted EBITDA margin was 28 percent of revenue. The Company invested $129 million in tuck-in acquisitions during the quarter and $220 million year-to-date through Sept. 30, 2017. In October, the Company acquired ReCommunity Holdings for approximately $165 million, which included certain tax benefits valued at approximately $50 million. 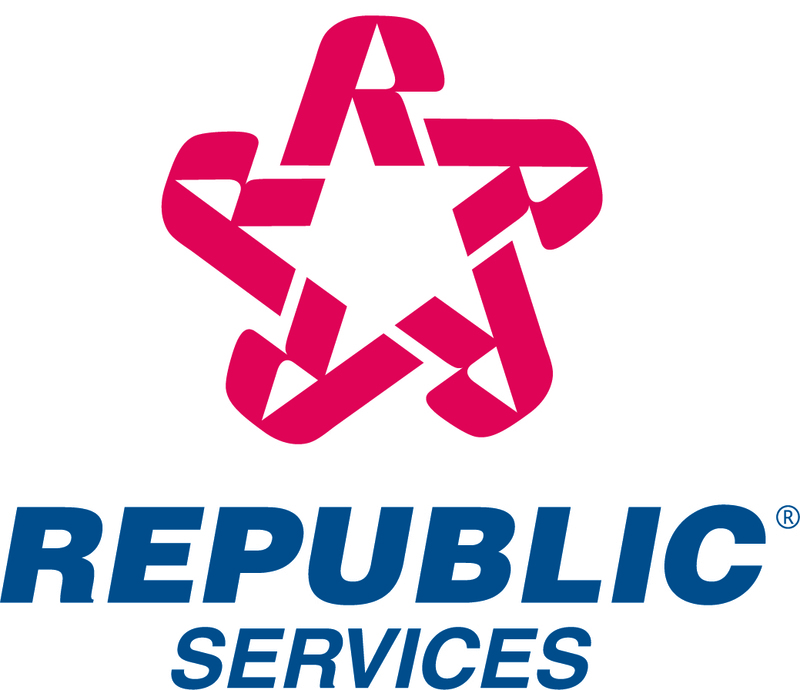 Republic continued to convert CPI-based contracts to more favorable pricing mechanisms for the annual price adjustment. The Company now has approximately $510 million in annual revenue tied to either a waste-related index or a fixed-rate increase of 3 percent or greater. 19 percent of its fleet operates on compressed natural gas, up from 18 percent in the prior year. 75 percent of its residential fleet is automated, up from 74 percent in the prior year. Republic was recently named to the 2017 Dow Jones Sustainability Index (DJSI) World and North America Indices for the second consecutive year. Republic is the only recycling and solid waste service provider in the world to be included in either index this year. Republic is providing a preliminary financial outlook for 2018. It should be noted that the preliminary outlook does not represent full detailed guidance, but rather a point-in-time estimate based on its current projections of 2017 performance, early reviews of the 2018 budget process and current business and economic conditions. Consistent with prior practice, the Company will provide formal financial guidance in February 2018 once the budget process is complete and full-year 2017 results are reported. Adjusted diluted earnings per share is expected to be in a range of $2.53 to $2.58, which excludes the impact of restructuring charges. Adjusted free cash flow is expected to be in a range of $925 million to $950 million. Adjusted free cash flow consists of cash provided by operating activities, less property and equipment received, plus proceeds from the sale of property and equipment, and is exclusive of cash paid for restructuring, net of tax. Mr. Slager commented, "We expect current business and economic conditions to continue into 2018, positioning us well for high-single digit growth in earnings and free cash flow per share despite a headwind from recycled commodity prices." Republic announced today that its Board of Directors declared a regular quarterly dividend of $0.345 per share for shareholders of record on Jan. 2, 2018. The dividend will be paid on Jan. 16, 2018. Republic continues to increase cash returns to shareholders while maintaining its investment-grade credit rating, and announced today that its Board of Directors approved a $2 billion share repurchase authorization which extends through Dec. 31, 2020. This was added to the amount remaining under the prior authorization, which was $95.1 million as of Sept. 30, 2017. At current prices, $2.1 billion represents approximately 10 percent of the Company's outstanding shares of stock. Adjusted diluted earnings per share, adjusted net income, adjusted EBITDA, and adjusted free cash flow are described in the Reconciliation of Certain Non-GAAP Measures section of this document. The adjusted diluted earnings per share and adjusted free cash flow related to the preliminary outlook are described in the 2018 Preliminary Financial Outlook section of this press release. Average yield is defined as revenue growth from the change in average price per unit of service, expressed as a percentage. Core price is defined as price increases to our customers and fees, excluding fuel recovery fees, net of price decreases to retain customers. We also measure changes in average yield and core price as a percentage of related-business revenue, defined as total revenue excluding recycled commodities and fuel recovery fees, to determine the effectiveness of our pricing strategies. Average yield as a percentage of related-business revenue was 2.7% and 2.6% for the three and nine months ended September 30, 2017, respectively, and 2.3% and 2.2% for the same periods in 2016, respectively. Core price as a percentage of related-business revenue was 4.3% and 4.4% for the three and nine months ended September 30, 2017, respectively, and 3.5% and 3.7% for the same respective periods in 2016. Reported diluted earnings per share was $0.66 and $1.81 for the three and nine months ended September 30, 2017, respectively, as compared to $0.25 and $1.23 for the same period in 2016. During the three and nine months ended September 30, 2017 and 2016, we recorded a number of charges and other expenses and gains that impacted our EBITDA, pre-tax income, net income attributable to Republic Services, Inc. (net income – Republic) and diluted earnings per share. (1) Line items in this column do not total to $1.65 per share due to rounding. As of September 30, 2017 and December 31, 2016, accounts receivable were $1,126.9 million and $994.8 million, net of allowance for doubtful accounts of $36.7 million and $44.0 million, respectively, resulting in days sales outstanding of 40.0, or 28.3 days net of deferred revenue, compared to 38.1, or 26.1 days net of deferred revenue, respectively. In July 2017, we paid a cash dividend of $107.8 million to shareholders of record as of July 3, 2017. As of September 30, 2017, we recorded a quarterly dividend payable of $115.7 million to shareholders of record at the close of business on October 2, 2017, which was paid on October 16, 2017. During the three months ended September 30, 2017, we repurchased 1.8 million shares of our stock for $119.3 million at a weighted average cost per share of $64.88. The amount remaining under the share repurchase authorization as of September 30, 2017 was $95.1 million. This press release contains certain forward-looking information about us that is intended to be covered by the safe harbor for "forward-looking statements" provided by the Private Securities Litigation Reform Act of 1995. Forward-looking statements are statements that are not historical facts. Words such as "guidance," "expect," "will," "may," "anticipate," "plan," "estimate," "project," "intend," "should," "can," "likely," "could," "outlook" and similar expressions are intended to identify forward-looking statements. These statements include information about our plans, strategies and prospects. Forward-looking statements are not guarantees of performance. These statements are based upon the current beliefs and expectations of our management and are subject to risk and uncertainties that could cause actual results to differ materially from those expressed in, or implied or projected by, the forward-looking information and statements. Although we believe that the expectations reflected in the forward-looking statements are reasonable, we cannot assure you that the expectations will prove to be correct. Among the factors that could cause actual results to differ materially from the expectations expressed in the forward-looking statements are acts of war, riots or terrorism, and the impact of these acts on economic, financial and social conditions in the United States as well as our dependence on large, long-term collection, transfer and disposal contracts. More information on factors that could cause actual results or events to differ materially from those anticipated is included from time to time in our reports filed with the Securities and Exchange Commission, including our Annual Report on Form 10-K for the year ended December 31, 2016, particularly under Part I, Item 1A - Risk Factors. Additionally, new risk factors emerge from time to time and it is not possible for us to predict all such risk factors, or to assess the impact such risk factors might have on our business. We undertake no obligation to update publicly any forward-looking statements whether as a result of new information, future events or otherwise, except as required by law.